Disney Junior’s animated Mickey and the Roadster Racers, is a madcap car-racing adventure series for preschoolers led by Disney’s No. 1 star, Mickey Mouse, and his pals Minnie, Pluto, Goofy, Daisy and Donald – as well as a host of international guest stars – will make its UK television debut this week on Disney Junior UK. The series, which will premiere internationally throughout 2017 and is coming to Disney Junior UK on Wednesday 19th April at 5pm, takes Mickey and the gang, along with their unique transforming vehicles, on humorous high-spirited races around the globe, as well as hometown capers in Hot Dog Hills. Off the racetrack, Minnie and Daisy also run their own successful business as Happy Helpers, solving problems for anyone in need of a helping hand. Geared towards kids aged 2 to 7 years old, the stories are designed to impart social and emotional lessons about friendship, teamwork, optimism and good sportsmanship. 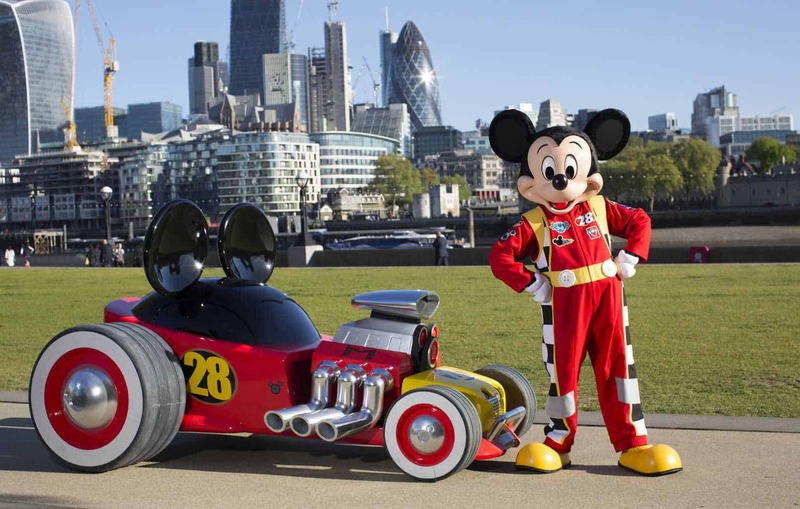 Mickey Mouse has been spotted out and about on the streets of London with his new Roadster Racer from the brand new animated series, Mickey and the Roadster Racers, on Disney Junior and DisneyLife. 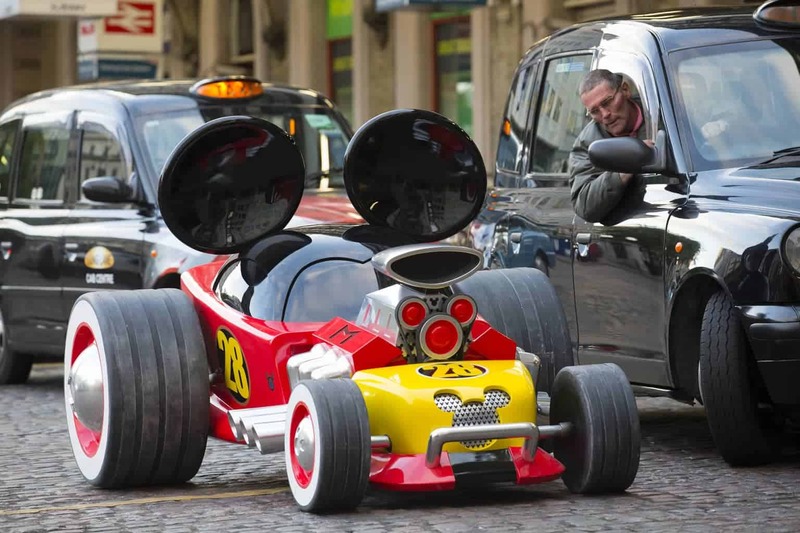 Mickey’s Roadster – ‘The Hot Doggin Hot Rod’ – was spotted at various locations across the capital. Commuters were surprised to see it lining up at the taxi rank at Charing Cross station, at Southbank and stopping at a zebra crossing in central London to let families pass. Created by a specialist team of eight engineers and experts, the model car took eight weeks to build and was commissioned to celebrate the launch of Disney Junior’s new animated children’s series. Mickey and The Roadster Racers sees Mickey and pals – Minnie Mouse, Donald Duck, Daisy Duck, Goofy and Pluto – racing across the globe on action-packed adventures, including a dash across London to stop a crown jewel thief. In a special London themed Mickey and The Roadster Racers episode due to air on Disney Junior and DisneyLife in May, Mickey and the gang attempt to track down a thief who has stolen the crown jewels, before returning them to the Queen. To celebrate the launch of Disney Junior’s animated Mickey and the Roadster Racers, Boo Roo and Tigger Too are lucky enough to have a Mickey Mouse and the Roadster Racers plush and activity set to giveaway.